Ostensibly a nod to class difference within the narrative, it’s also arguably a tongue-in-cheek dig at the novel’s self-reflexive straddling of high and low culture. “Shutter Island,” of course, is Grand Guignol of the highest order, but with an acute awareness of the term: steeped in references to throwaway pulp fiction and lurid 1950s B-movies, but written with the literary discipline and deference of a serious novelist. 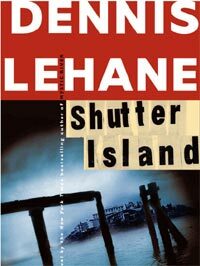 Needless to say, Boston-ish setting aside (and even then, “Shutter Island” goes to significant dramatic lengths to distance itself from the city), the novel is a very different beast from the two Lehane titles successfully given the screen treatment in recent years. For all their whodunnit trappings, “Gone Baby Gone” and “Mystic River” traded largely in earnest authenticity; “Shutter Island,” by contrast, hinges on artifice. Lehane has apparently stated his admiration for Graham Greene’s alternation between “novels” and “entertainments”: this, carefully wrought and quotation mark-enclosed as it is, is plainly his idea of a pure entertainment, a funhouse, a ride. Accused by many a critic this decade of neglecting his impeccable genre capabilities in favor of impersonal Oscar-chasing, he finally got to have his cake and eat it with “The Departed,” an unabashed crowdpleaser that married no-nonsense studio mechanics with supreme mastery of craft, and thereby pleased almost everyone, Oscar voters included. To continue the Lehane-Scorsese parallel, one could therefore argue that Scorsese already had his “Shutter Island” moment with his last feature, that this adaptation — a second consecutive dip into pop-thriller waters, with a Beantown milieu no less – could represent something of a beat repeated in his career. The closer reference point within the director’s oeuvre would appear to be the more excessive, camp-tinged horror flirtations of 1991’s “Cape Fear,” though there’s a romanticism at play in Lehane’s work that separates it from that too. If it seems that I’ve spent a lot of column space discussing the generics of “Shutter Island” as a novel ahead of its narrative specifics, that’s because it’s a difficult story to discuss in any evaluative depth without immediately entering spoiler territory, which isn’t somewhere I particularly want to go. You’ve heard that it revolves around two U.S. Marshals investigating the escape of an insane murderess from a high-security mental hospital on the remote, eponymous island; even those who haven’t read the book have doubtless heard that the narrative turns on a game-shifting twist for which such stock movie-trailer incantations as “nothing is what it seems” and “nobody can be trusted” might have been invented. It’s also a twist for which film treatment poses both significant advantages and slight question marks – in the case of the latter, because it relies on psychological tricks of perception, heavily enmeshed in the novel’s structural reliance on flashback and dream sequences, where the reality is easier to withhold on the page than on the screen. Having read the novel, there are components of the film’s casting that don’t quite line up with Lehane’s character structure: it would appear that Scorsese and screenwriter Laeta Kalogridis (who has experience of such high-flown territory with the Russian thriller “Night Watch”) have made some adjustments – and possibly imagined a character or two – in the interests of maintaining Lehane’s literary illusion. On the other hand, cinematic treatment stands to rectify the slight unravelling of Lehane’s final act, in which he lands several key revelations slower than many readers can anticipate them. (Anyone with a head for anagrams – such as yours truly, I’m afraid to say – is in danger of placing some crucial puzzle pieces alarmingly early in the game.) The film will inevitably hasten and layer the accumulation of information and, in doing so, hopefully afford the viewer less time for contemplation – editor extraordinaire Thelma Schoonmaker has her work cut out for her here. The best reason for filming “Shutter Island,” however, is that the novel desperately wants to be a film itself. From Lehane’s atmospheric evocation of spooked cemeteries and shadowy corridors (production designer Dante Ferretti should have a field day here) to several gleefully heightened characterizations, the novel taps into a rich (and diverse) selection of Hollywood genre history, from vintage noir (it is set in 1954, after all) to full-throttle horror. Above all, Hitchcock must have been prominently in Lehane’s thoughts while writing: the progressive mental torment of protagonist Teddy Daniels (an intriguing assignment for Leonardo DiCaprio), and indeed the novel’s wink towards the hokey pop psychology of the era, recall Hitch’s own dabblings in psychological melodrama circa “Spellbound” and “Under Capricorn.” I expect Scorsese and DP Robert Richardson to take full advantage of the allusion. As much as the novel promises a technical playground for Scorsese’s collaborators, the handpicked (and, in almost every case, cannily so) cast should run riot here too. For much of the film, DiCaprio and Mark Ruffalo (as his fellow Marshal) seem likely to play the straight men to a flashy array of villains and crazies. Chief among them, Ben Kingsley should tackle the part of a devious, cultured head shrink with plummy relish. Meanwhile, barring major structural changes in the adaptation, there should be juicy (if needfully hammy) one-or-two-scene cameos for the likes of Max von Sydow, Patricia Clarkson and Jackie Earle Haley. Emily Mortimer’s role as the supposed murderess is a wild card – potentially arresting or throwaway — in that I can’t figure out how the character will be presented on film. My hunch, however, is that it’s Michelle Williams, as DiCaprio’s deceased wife, who has the heaviest (and subtlest) dramatic lifting to do in the supporting cast. What of its Oscar potential, you ask? I think it’s fairest to all concerned to approach the film with such concerns tucked as far back in one’s mind as possible: you needn’t be an awards expert to tell that “Shutter Island” hardly occupies the Academy’s favored genre bracket. Of course, from “The Silence of the Lambs” to “The Sixth Sense,” there is precedent for such unlikely fare to enter voters’ good books, the requirement being that a) the film is very, very good and b) that audiences agree en masse. “Shutter Island” has enough balls to juggle as it is – the risk of overstepping the critical mark with playful, heavily styled material like this is great – without having to face such pressures from the outset. Lehane wrote the book as an “entertainment”; let’s treat the film accordingly. I read the novel and was surprised Scorsese was going to make it into a film considering the plot twist that may not satisfy the audience. The only film that I think “Shutter Island” is similar to is David Fincher’s “The Game” in terms of it’s plot machinations, and that film received decent reviews and did lukewarm business domestically. Guy, what do you think this film will make at the box office? Oh, I know next to nothing about box-office — a guess from me would be totally irrelevant. But I don’t think this is mega-hit territory … I doubt it’ll do as well as “The Departed,” for instance. Didn’t bother me. More haunted than terrifying. She’s supposed to be incredibly beautiful, which Emily Mortimer (for me) isn’t quite, but no matter. I’m still puzzling over exactly how much the film gives her to do. The book overall seems remarkably cinematic to me although the twist could be something Scorsese can play with a bit and hopefully he will. I’ve heard some who’ve seen a rough cut say they didn’t like Michelle’s character but I wouldn’t want to say anymore since I’ve read the book and there’s an explanation. I think if there is an audience out there interested in an intelligent horror/gothic mystery with more up its sleeve than meets the eye (and definitely more than the trailer seems to indicate), it could do well. Got my fingers crossed. The girl next door? Hardly. The photo reminded Teddy of a concentration camp victim who died shortly thereafter. When I read this novel last summer I thought it was one of the most entertaining things I’ve ever touched. I absolutely loved it and can’t wait to see the film. I KNOW Scorsese will do me proud. I thoroughly enjoyed Lehane’s novel. Combine that with Scorsese and the top notch cast he assembled, makes it a ‘must see’ film for me. Having recently read the novel, may I add that I believe Ruffalo’s casting is spot-freakin’-on??? Scorsese -now long rich -continues to run stale and play off the circle-jerk adoration of diehard fans. Save your $10.50 for this movie. It’s need for four different plot explanations should say it all. Confusion, delusion, refusion, protrusion, Scorsese simply didn’t do it clarity or definitive justice. Perhaps when I read the novel, I might understand why Martin got so confused. A waste of time and money.